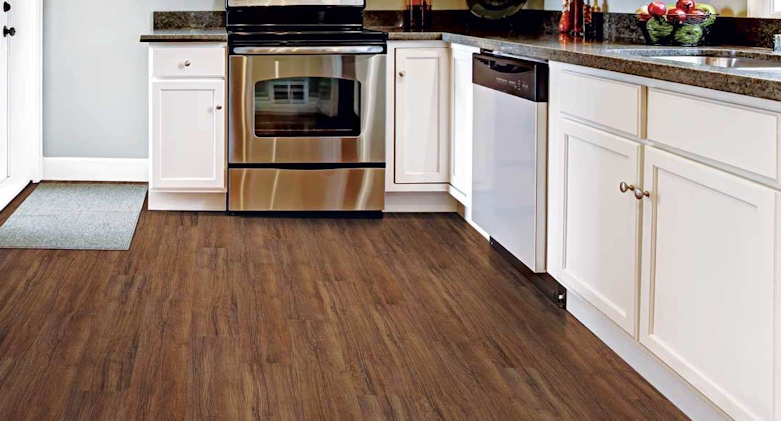 Luxury Vinyl Tile and Planks (LVT) is an engineered material that’s been optimized to provide a resilient, water-resistant surface that is appropriate for most rooms in any house. One of the main benefits of LVT is it’s impermeability to water. The luxury vinyl tile brand Fusion has created a hybrid product that’s 100% waterproof and can be installed in places other flooring options cannot (e.g. on concrete or in moist areas). Not only have the developments in technology improved its durability, LVT looks more like natural hardwood or stone than ever before. You can get really creative with LVT. You can select different options to replicate the look of stone, ceramic tile, hardwood flooring, and more. And compared to hardwood flooring, ceramic tile, or natural stone, LVT is much easier to clean on the day-to-day and maintain over time. It’s also much easier to install. So while you may pay just as much per square foot for the material (depending on which options you’re looking at), the installation price will be much less per square foot since your flooring professional has more flexibility with the material. 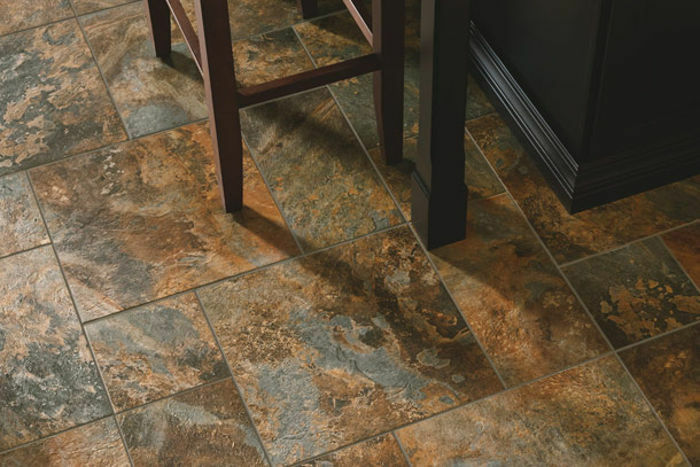 Luxury Vinyl Tile is a great option for most any room because of its diversity in style and durability. It’s water and moisture resilient, so it can work in places that other options, like hardwood, may not. It’s durable on the surface, and endures limited scratching and wear-and-tear. Porcelain and ceramic tile are extremely hard materials that are fairly to clean on the day-to-day. Tile is a great choice for high-traffic and high-intensity areas, like foyers, laundry rooms, and kitchens because it’s super hard and durable. Tile is also impervious to water, so you’ll see it in most bathrooms and laundry rooms as well. The hard surface is a major plus in most cases, because you don’t have to worry about scratching, dents or warping. But since it’s so hard, it’s not the most comfortable surface to stand on for an extended period of time (glasses and plates will also break much easier on tile, so be careful!). Consider getting some thick, soft rugs or mats if you expect to be standing on it for a time (at the kitchen sink, at the laundry machines, at the entrance way). Daily cleaning is easy on tile. All it requires is a sweep and mop. You can also vacuum your tile flooring if you use the right vacuum setup. One downside of ceramic or porcelain tile is that the grout can sometimes become stained, and that’s not always easy to clean. The grout can also get scraped away, and repairing it will require a bit of effort from a professional tile installer. This kind of wear and tear usually doesn’t come about for several years, and you can extend the life of your tile by following some best practices. Just like with hardwood flooring, you’ll want to keep an eye out for any small signs of wear-and-tear. 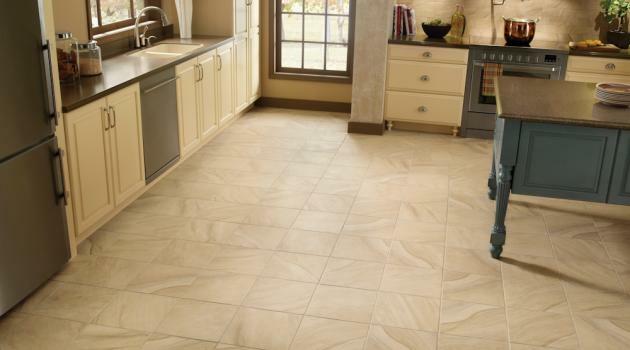 Porcelain or ceramic tile is a great option for flooring in many rooms of your house. It won’t get damaged by water, and its very resistant to scratching. You’ll want to keep an eye on the grout in high-traffic areas, and always utilize rugs or mats to help reduce any wear-and-tear. Start with a Free Consultation and Project Quote - no worry necessary. Thank you. Sierra will reach out to talk more about flooring options with you. You can get hardwood flooring in two high-quality options: natural hardwood and engineered hardwood. Natural hardwood has been around for a long time, and consists of whole planks of natural hardwoods that are laid and nailed to the base of the floor. Engineered hardwood is comprised of under-layers of hardwoods while the very top layer is made of a factory-treated plank of the hardwood species you choose. This kind of treated hardwood makes it much more resistant to water damage and scratching. While natural wood or engineered wood floors aren't as sensitive as they once were, water and humidity can still harm wood flooring. Water damage can happen from small but consistent exposure to water. Whether it’s from one huge leak, constant tiny spills (think under the dog’s water bowl) or major changes in humidity, the wood can get stretched, cupped, spread apart or cracked (a note of importance: engineered wood will not cup or split from moisture or changes in humidity. Older natural wood flooring will do this, but newer varieties have been treated to prevent this kind of damage). Damage to natural hardwood floors is preventable. Plus, hardwood flooring is one of the easier flooring materials to repair over time, or just replace a small portion if needed. Never wet mop your hardwood floor. What seems like a small amount of water can do damage. Instead, use a well-rung damp cloth and spot-wipe the floors when needed. There are also vacuums that are great for hardwood floors. Place carpets or mats over high-traffic areas to prevent excessive scratching and wear-and-tear. Avoid rubber-bottomed mats, which can hold water and do unseen damage. As a rule of best practice, clean under your mats and rugs once a week to ensure there is no scratching or water damage taking place. Remember that dog bowl? Place down a mat that prevents any water from landing on the floor. Use this practice in other areas as well, like near the door (especially in winter), at the sink, near the refrigerator (especially if you have a water and/or ice dispenser). Create a maintenance schedule. With wood floors, small problems can sometimes turn into big problems. Keep your hardwood floor maintenance top-of-mind and execute a regular cleaning and maintenance schedule. Sweep daily, vacuum weekly, use a recommended hardwood floor cleaner once a month. Your floors may call for a professional maintenance coat every 5-7 years, and after 10+ years, you might need some refinishing work or plank substitutions. Not only do hardwood floors provide an unparalleled look and feel for your home, but it will increase your home’s value far beyond most other flooring options. 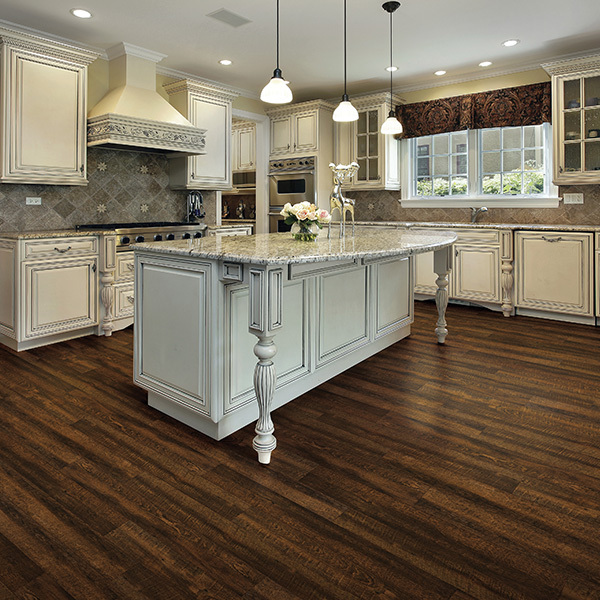 Hardwood flooring looks fantastic, and is one of the easier flooring options to keep clean. Changes in the material and quality of natural and engineered hardwood floors have made them much more resistant to water and damage on the surface. Laminate flooring is made of wood composite that’s pressurized at high temperatures - then an image is laid over top and finished with a clear cover. This allows you to get the hardwood look without the price and upkeep that natural wood flooring requires. You can get the colors and wood species of world-class flooring at a fraction of the cost (and the environmental impact). Be careful though - if you get a cheaper style of laminate flooring, that image won’t look exactly like hardwood, and you might experience an unnatural repetition of patterns/grain on your flooring. Laminate flooring is certainly durable (all that heat and pressure creates an extra-firm material), but will succumb to water damage and scratching. Anything sharp could potentially puncture the floor if dropped. Though it’s not as sensitive to water as natural hardwood, unattended spills or steady exposure to water (there’s that dog bowl again!) will result in discoloration or even bubbling up at the surface. Here is a lot of detail on your laminate floor and water. The top layer of laminate is durable (even treated with a UV protectant that will prevent most damage from prolonged exposure to the sun), but like most materials, will scratch if not cared for properly. In some cases, you may be able to replace individual tiles or sheets, but many times the new pieces will not match the color of the older pieces, which can cause a headache or two. Laminate flooring is a fine material to choose in many cases. It certainly won’t create the same effect as natural hardwood, but with the significant reduction in cost, it can work splendidly in places where you simply don’t need hardwood. It’s somewhat resistant to water and scratching, and it’s difficult to predict the feasibility of repairing just a portion of the floor. Consider laminate flooring as a very affordable option for flooring in places that will receive moderate-to-high foot traffic, and fairly low exposure to water. At the end of the day, redoing your floor is going to change the entire look and feel of your rooms and home. If an experienced designer helps you find a quality surface, and a professional installation team lays it down, you’ll be making the right investment for your home. And hang on to this flooring guide while you’re shopping so you can keep some of these main points in mind.